Whether it’s for system design, safety assurance or installation, DMA has developed a wide range of expertise in the field of alternative energy in the transportation sector. We have implemented turnkey natural gas / hydrogen fuel systems for both small and full-scale Alternative Fuel Vehicle (AFV’s) fleet fueling stations around the world. We can help make your business more economical by utilizing natural gas / hydrogen alternative fuel technologies in order to satisfy your transportation system needs. The key first step is to help you select the most suitable alternative fuel for your fleet. Alternative fuels can be especially advantageous to your business when they are produced under non-peak periods, when the cost of fuel / energy is at its lowest, and then utilized under peak demand periods, when the cost of fuel / energy is at its highest. This provides a way for your business to save money by providing a new energy source at a lesser cost than more traditional forms. In addition, these alternative fuels can be stored on site, making them readily available. This energy system is especially economical for the re-fueling of fixed route AFV fleet vehicles such as transit fleets, taxis, buses, cars, and delivery vehicles. Besides the economic advantages that alternative fuels can provide, there are environmental advantages as well. Alternative energy systems produce fewer harmful emissions and greenhouse gases (GHG's) that are detrimental to our environment. For this reason, alternative fuel systems are able to aid your company in satisfying government environmental regulations. 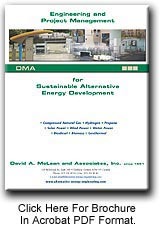 DMA consultants are experts in designing and implementing an alternative fuel system that would be most beneficial to your company. An alternative energy transportation system could increase your operational efficiency while reducing your harmful emissions. DMA can also provide power generation systems that utilize time-of-use rates from your local electric power grid to allow you to take advantage of off-peak rates. Using renewable natural resources as the primary source of power generation for your alternative energy system can provide your company with an environmental and operating cost advantage. Utilizing a renewable resource such as wind power, water power or solar power enables you to produce energy on site to power your fuel system. Fuel produced by the primary power systems, such as pure hydrogen, can be used immediately or stored on-site. On-site storage allows you to have a secure, readily accessible and cost effective way to meet your changing energy needs. Stored energy can be transformed to usable power generation in a number of ways. Fuel cells are a rapidly emerging commercial way to produce electricity. They utilize a chemical reaction that produces electricity from fuel sources like hydrogen. In essence, they provide a way to effectively “store” electricity that is not reliant on batteries. The electricity produced may be used at the site, it can be sold back to the “power grid” or a combination of the two. Stored fuel is used to power an internal combustion engine that, in turn, powers an electrical generator. Like with fuel cells, the electrical output can be used to power operating systems at a cheaper rate during on-peak electrical times, or it can be used in a “grid parallel” mode. Fuel is used to power an internal combustion engine that provides shaft power. Shaft power can be used to power other machines such as air compressors, pumps and chillers. A system can be installed that recovers the waste heat that the alternative energy system generates. This heat energy can be captured and reused for other low grade energy requirements, thus greatly increasing the overall efficiency of your alternative energy system.